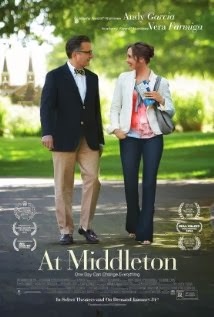 Movie Review: Adam Rodgers’ first feature film, “At Middleton”, joins Vera Farmiga and Andy Garcia (who also produced) in a one-day-romance set at Middleton College campus while their children were taking a tour. Garcia plays a polite and charming cardiac surgeon who gives special attention to exterior appearances, demanding neatness from his respectful son. In turn, Farmiga gives shape to Edith (Farmiga), a daring, mouthy, and pretty much alive woman who seems to have difficulties to handle her undistinguishable daughter Audrey (played by Vera’s younger sister, Taissa Farmiga). The quartet will provide us with several situations, some digestible and some nauseating, in which the youngsters try to act like adults while the adults looked like two naughty kids when have some minutes of freedom. I cannot say that the film hasn’t one or two decent moments, but for the most of it, its jokes didn’t work very well and the adopted posture was too childish and stale to engage. I also found the episodic presences of nerds, teachers, and visitors, a bit forcible, once they only appear in convenient circumstances that never seemed natural. “At Middleton” tries to pose as cool or irreverent, but ultimately feels feckless, just to mention a word widely used by the characters in this film. Despite some irritating personalities, the acting was fine in general, but didn’t save the film from being a flop on comedy and especially on romance.